Hello hello! some bits & pieces I’ve been meaning to share on a rainy day, and it is indeed a rainy day! 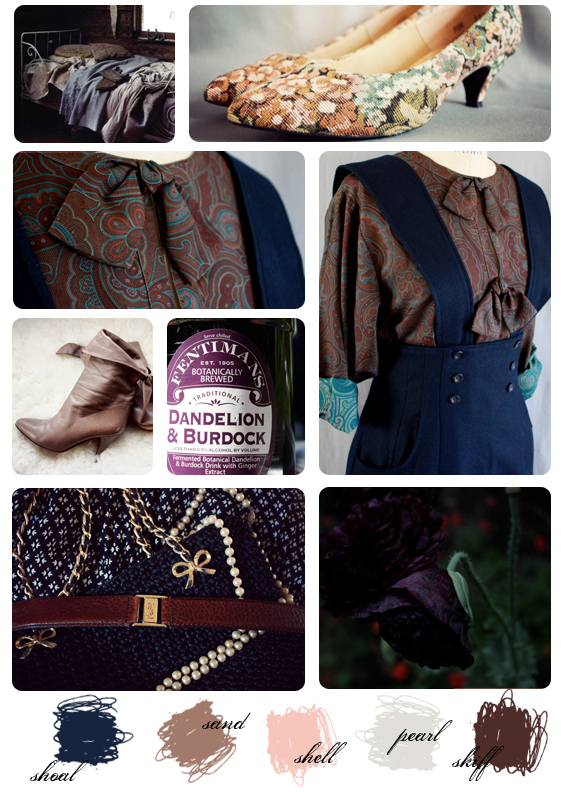 Magpie palette moodboard from recent thrift finds & various bits. Click to enlarge. 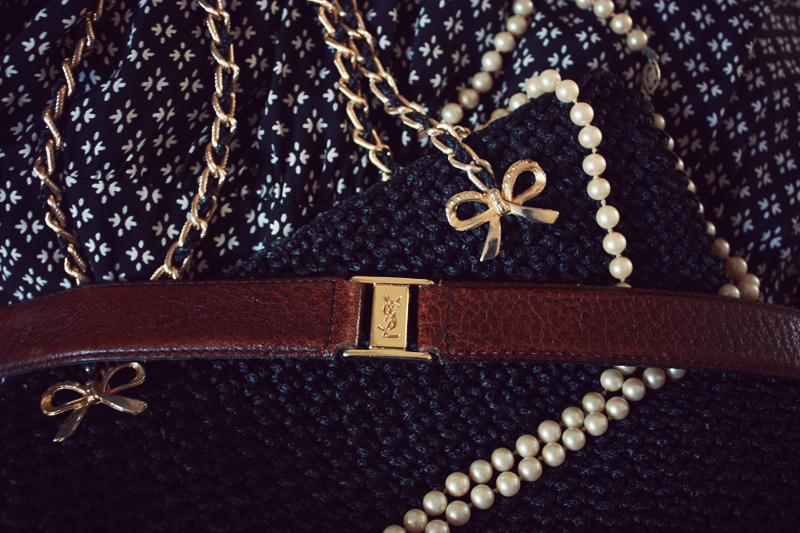 Bow chain handbag, YSL belt, string of pearls, Maggy London dress: destined for the shop. Hand me downs from my aunt! 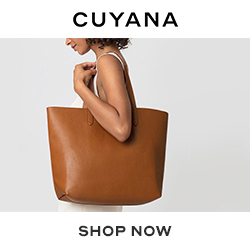 I can’t decide, shop or keep? So comfy, my size, look amazing with jeans…but I have SO MANY shoes. Paul Stuart silk top with bows, vintage navy wool skirt with suspenders, for the shop. I need a sunny day with some spare time for a major photo session! Ooh, I may have to declare “shoal” as my new favourite colour! Although I am sure I have heard it used to describe…something…I don’t think I ever actually was able to envision it. Not as flat as navy blue, not as purple-prosey as midnight blue – I quite love it. …and I must know! What, praytell, is that mysterious elixir/tincturein the bottle labeled “burdock and dandelion”? A shoal is a shallow bit just out to sea, but I was naming the colors all sea-side-y things, and it fit! The soda! I am so addicted!!! I will for sure be bringing cases to the wedding picnic. Oh, I LOVE those floral shoes!! I like the heel height (I can’t do too tall). Keep the floral shoes. They’re awesome. THOSE BOOTS!!!! And have you had the herbal drink? yes, i took the photo! i’m addicted! & yes, the boots are a new favorite! ack, what’s one more pair of shoes… you should keep ’em! i vote to sell the shoes, simply based on the number of shoes you have right now. perhaps you can weed out a pair you already have so you don’t have a net addition to the collection? ultimately i’d say it depends on how much you will be upset to let them go. maybe save for a bit and see how you end up feeling about them. also how in the hell do i change my picture here? me again. i am in love with your new wallet as well. the end.